Big LA Marathon news today: Deena Kastor will be running the race this year; her first marathon since the birth of her daughter two years ago. Mother runners, unite! Deena and I have run a few races together, actually. Like the Circle of Friends NY Mini 10K back in 2004. She won. I came in 1,023rd. 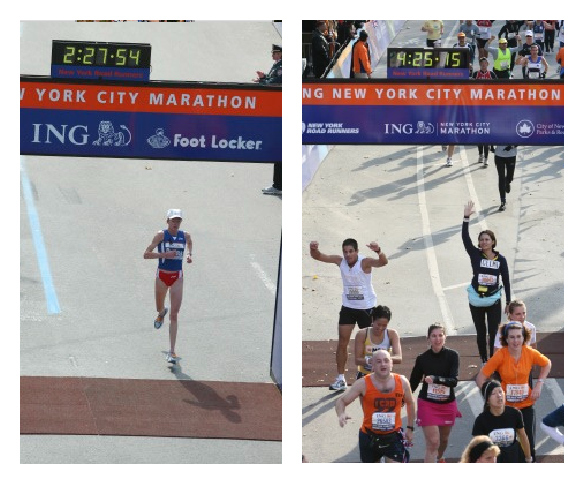 And the New York City Marathon in 2006, where she placed 46 overall, and I was number 19,083. Actually, make that 19,082 because surely Lance Armstrong‘s result (868th) has been annulled? Seriously. Looking forward to rubbing shoulders with Deena again! Speaking of rubbing shoulders, later this year I will be doing just that with a bunch of my son’s favorite celebs: Mickey, Minnie, Goofy, Woody; you know, all those guys. I just signed up for the Disneyland Half Marathon on September 1! My 13-in-2013 schedule is quickly filling up, the only “free” months I’ve got so far are July, August and December. I still can’t believe I spent more than $180 on a race entry, though — and another $20 for the kids run, and $15 and change for the commemorative Mickey ears for the kiddo because, let’s face it, he’ll make me buy ’em when we get there anyway. And the park tickets that will have to be purchased for the three days we’re there. Worse, I was perfectly willing to shell out $300 for the Dumbo Double Dare, i.e. 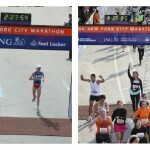 running both the 10K and half marathon. But it sold out within minutes! Those Disney races are darn expensive — and way too popular; aren’t they? Well, now at least I’ll get to see what the big deal is! 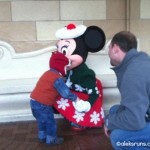 And someone will surely love going back to Disneyland and seeing the girl who gave him his very first kiss! Your turn: What is the most expensive race you’ve run? Was it worth it? Have you ever run with the big ones? You know: Meb, Ryan, Deena, Dean (sigh, my running hero); those guys? 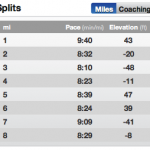 A five-mile tempo run with a one-mile warmup and one to two miles cool down. A tempo run for me is anything in the 8-8:30 minute-mile range. 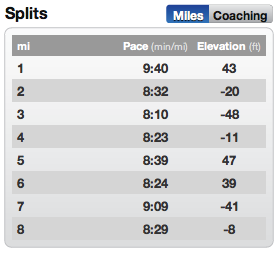 I can’t say I wasn’t secretly hoping to nail 8-minute miles for all five, but… oh well, it was hard. I did my best. For my next marathon, I want to hire a coach. A really, really mean one who makes me cry if I don’t meet and exceed goals. Any recommendations? Speaking of Disney….I’ve just returned from the Tinkerbell half! 🙂 I, sadly, did not train for it (meaning my IT bands), so it was really half of a half of a good run, followed by a powerwalk. 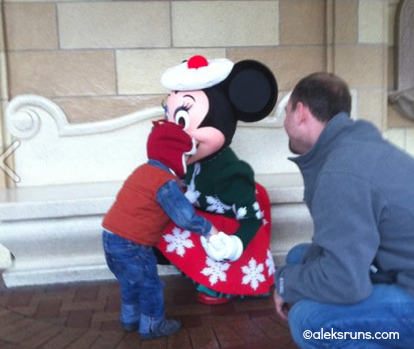 The race wasn’t so expensive as the accommodations–the Mouse will get ya with the hotel. But the convenience of the Disneyland Hotel to the start and finish could not be beat and I’d pay for that convenience again. A little disappointing was the expo/swag–the Mouse is mighty stingy on that front. Then again, nothing can compare with New York, right? Speaking of which, I could have sworn you won 2006! 😉 Next time I’m on the left coast for longer than a weekend we need to hook up for a run–scrap that, a coffee! P.S. I had VERY seriously considered registering for the Tinkerbell. If I’d known you were doing it, I would have!